Our customers are the who-is-who of their industries. With this in mind, all of our products go through a tough product qualification phase, before they are approved for the market. 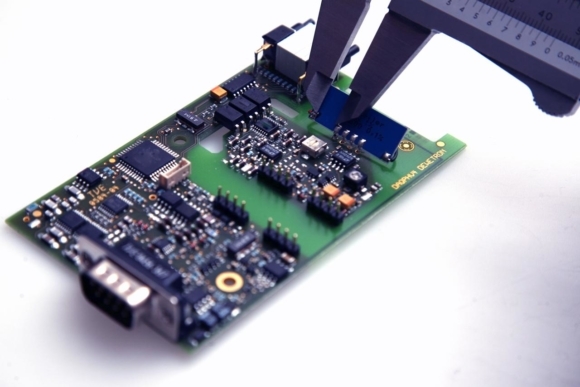 Starting with the design phase, all our products and components are tested rigorously against customer requirements, specifications, industry standards, regulations, robustness and overall quality. 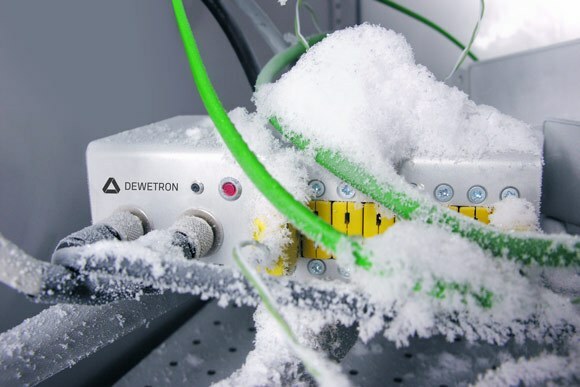 During their lifecycle DEWETRON products are exposed to numerous environmental influences, which could directly or indirectly affect function, life span and reliability. With our methods of quality control, we can assure that all our products comply with customer requirements and reliably fulfill their function over the long term. The IECEE CB Scheme is an internationally recognized multi-lateral certification system for electrical and electronic products based on the IEC international standards. It aims to simplify the certification process for entry into the international market. All DEWETRON products are tested by accredited labs according to harmonized standards and receive a CB Scheme test report. This is the basis for admission to the non-European market. On request, we can test against a broader range of specifications or the requirements for your unique application(s). We live in a world full of electromagnetic fields. RF equipment, frequency converters, electrical engines and some medical devices create such fields. Using a generator and an antenna to create a strong modulated, electromagnetic field, we test the immunity of our devices against radiated disturbances. 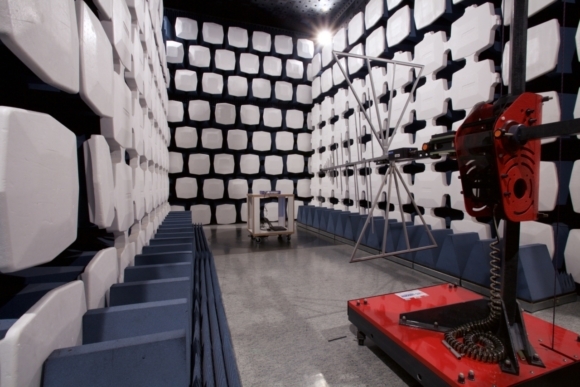 Testing is conducted in a special anechoic test chamber, in a certified contract lab. Magnetic fields such as those originating from large transformers in the mains frequency domain (50/60Hz) are ubiquitous. By placing the test device in a large coil and inducing a strong magnetic field produced by a generator, we can assure the function of the device in such an adverse environment. Fast transients or bursts are high frequency electrical disturbances caused by switching events in the power network. Surges are usually induced by lightning and are single peaks with high energy. We simulate both disturbances in our lab using a burst/surge generator. Short voltage drops can occur if high current devices are switched on. Faults in the network may even produce short interruptions. This is not unusual in industrial environments. 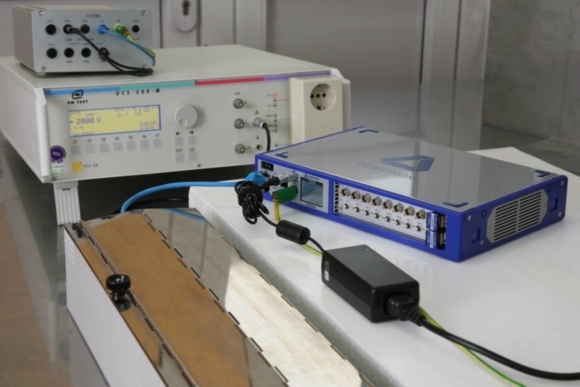 We simulate voltage drops and power interruptions in our product qualification lab tests using a special generator, consisting of a wave form generator and a power amplifier. If a device is relatively small in relation to the wavelength, interfering signals will not significantly excite the device itself. But connected cables will act as antennae and can become resonant. The signal will then conduct into the device through its ports. 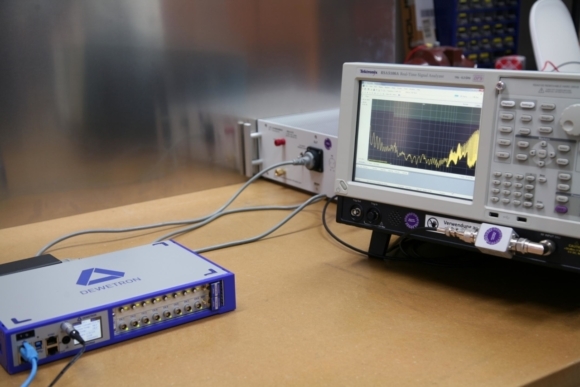 By using a coupling network, we can introduce such disturbances into the connection lines of the device and test for immunity. Persons and objects can accumulate an electric charge, especially in dry environments. If an electrostatically charged object touches a conductive part of a device, an unwanted, sudden flow of electricity is induced, which can destroy electrical circuits. We simulate this with our ESD (electrostatic discharge) gun. Every electronic device produces electromagnetic radiation, which could interact with other equipment. 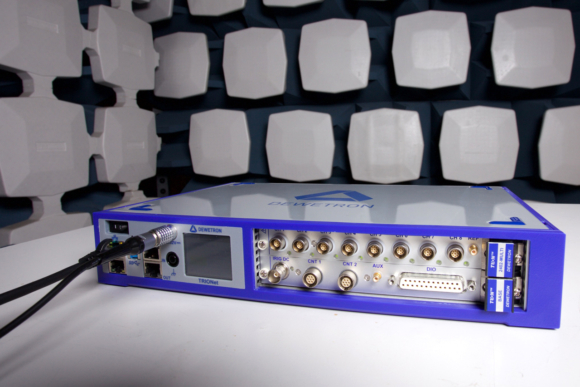 We measure and analyze the amplitude and frequency of the radiation sent out by our devices using a special receiver (spectrum analyzer) and an antenna. 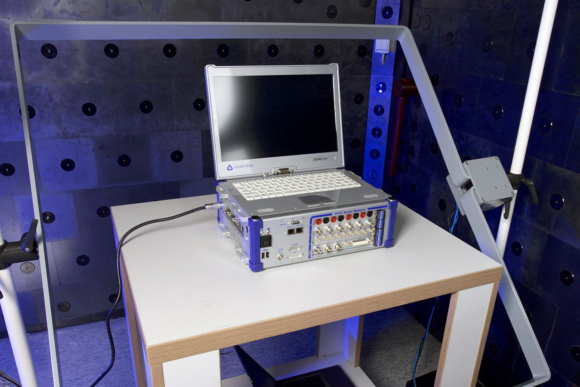 This measurement and analysis is conducted in a certified contract laboratory, as a shielded and anechoic chamber must be used to lock out all external influences during these measurements. 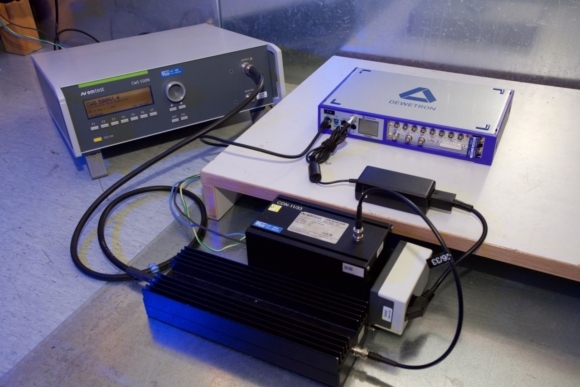 Switching power supplies and nonlinear components can cause disturbances that are conducted into the means or a vehicle supply network via power cables or other connections. Using a line impedance stabilization network (LISN) and a spectrum analyzer, we are able to detect, measure and prevent such disturbances. Visible electric light intensity variations are known as power-line flicker. Flicker is generated over the source impedance of the grid by changing the load current of a device. 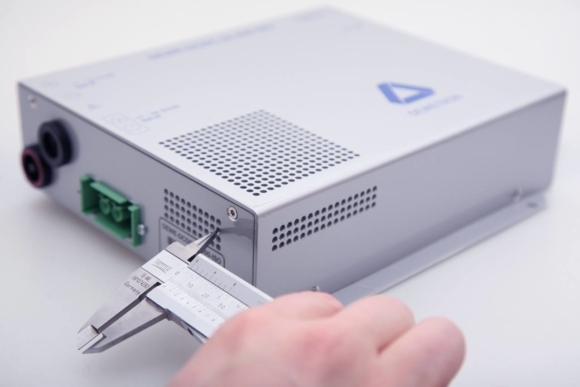 We measure and limit flicker and harmonic disturbances generated by our devices to prevent any distortion of the supply voltage for sensitive lab equipment. DEWETRON products are at home where the action happens: mounted on a motorcycle, in a test rig on a 50 megawatt diesel engine, in a wind turbine or on a rocket launch site. 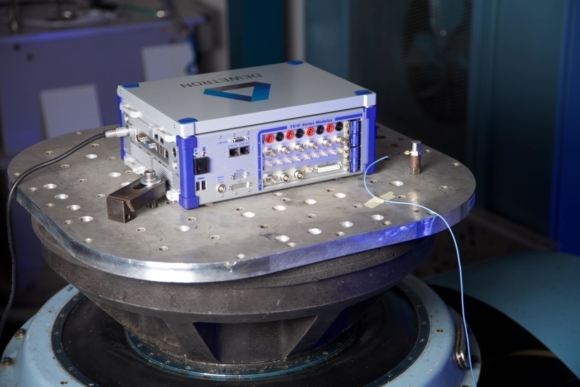 Because robustness is critcal in those applications, we test all of our devices on electrodynamic shakers to simulate vibrations and impacts during operation and transport. Precision components like a cozy temperature and low humidity for optimal performance. We have developed dedicated cooling mechanisms and use temperature compensated components to offer a wide operating range. A climate chamber is used to validate our specified (and extended) operating ranges. This way we can ensure, that our DEWETRON products can be used on a Swedish ice lake as well as in Nevada’s desert. Temperature and humidity influences from storing and transport are also simulated. On the one hand it is necessary to protect the sensitive electronics from outside influences such as water, dust and rigid objects. On the other hand, there may be hazardous voltages inside a device’s housing, that might be harmful if touched. Ingress Protection (IP) classes specify the level of protection a given housing provides. We use test fingers, rods, dust and water spray/shower chambers to check for IP class. Every electric device introduced to the market must comply with all safety regulations in the target region. 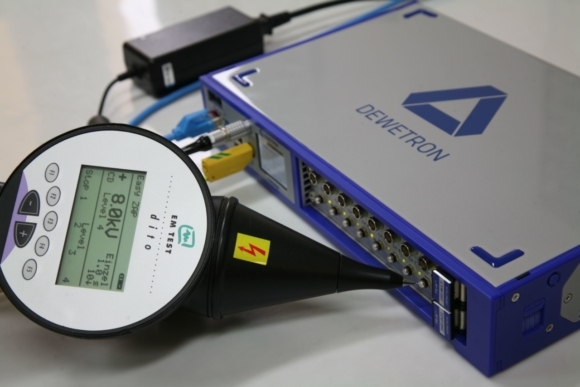 The European Low Voltage Directive (LVD) and the safety standards of the IEC/EN 61010 series (safety requirements for electrical equipment for measurement, control and laboratory use) serve as a basis for all tests. In addition to our internal testing we collaborate with an independent accredited lab for safety testing. 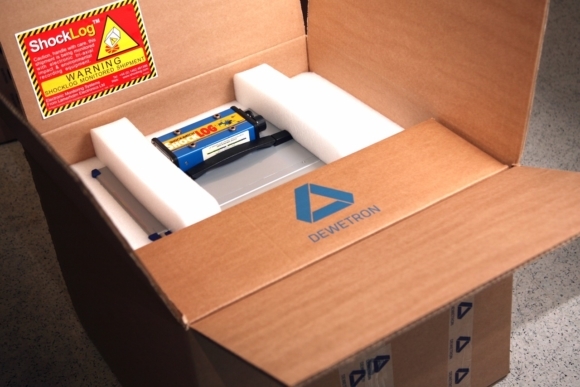 Based on legal requirements, such as IATA regulations, acceleration logger data from sample shipments and our customer’s feedback, every DEWETRON product receives its own packaging, which is tailor-made to its dimensions, weight and means of transportation. Wherever possible, we use reusable packaging and environment-friendly materials such as recycled paper and cardboard instead of bubble wrap and plastic.